Singer 4432 Heavy Duty Sewing Machine is an extra-high sewing speed machine from the world’s first producers of zigzag and electronic machines. Singer, which is well-known for developing and introducing most advanced and innovative home products in the market has released its yet another milestone product more recently. This product comes with lots and lots of exciting features and can be rightly called as the true workhorse. This model has been constructed with several convenient features and Singer has not disappointed its customers in anyway. 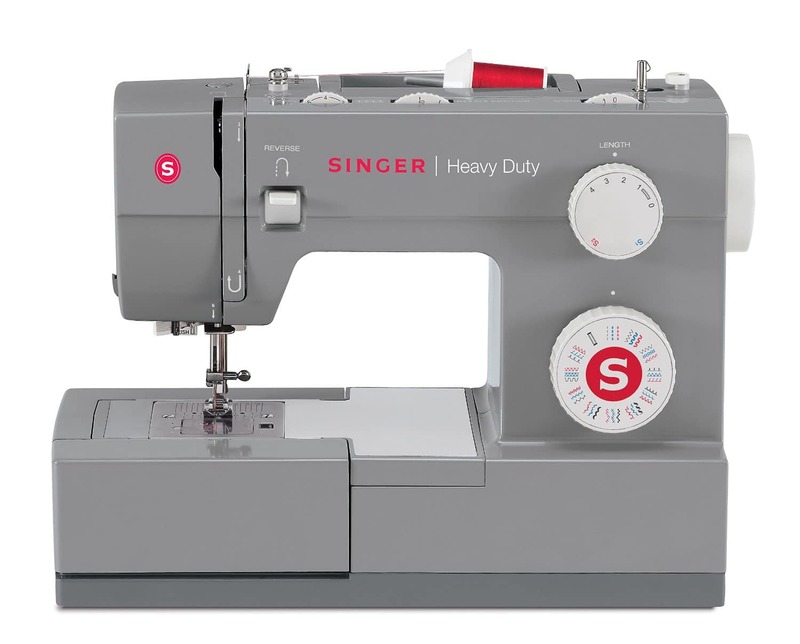 Their dedication in helping people to express themselves in sewing had led to the development of Singer 4432. The current sewing machine model from Singer has been built with a heavy duty metal interior frame and the stainless steel bedplate. This heavy duty metal frame holds all the mechanisms in perfect alignment and offers you with the skip-free sewing and high level durability while the stainless steel bedplate provides you with an effortless glide. This sewing machine has been constructed with a 60% stronger power motor than many standard sewing machines like Brother LS2125i sewing machine. Due to this structure, the current model in review can sew through heavyweight fabrics without any hitch. Moreover, this model has been constructed with more of convenience features which would add a new dimension to heavy duty sewing. The complete set also includes a host of accessories and an instruction manual with stitch guide. Thirty Two Built-in Stitches: The current sewing machine model has been constructed with as many as 32 built-in stitches which include the following: Six essential stitches which are the core stitches for construction and mending. Seven stretch stitches that are specifically designed for moving with your fabrics. Eighteen decorative stitches that would allow you to create special details in any of your projects. One-Step Automatic Buttonhole: This feature would allow you to make any number of buttonholes in a single easy step. You can be able to create any number of perfectly-sized buttonholes by making the best use of this feature. Extra-High Sewing Speed: According to sewing machine reviews, the extra-high sewing speed of 1100 stitches per minute produced by this machine would allow you to finish your projects in a lesser time than the conventional ones. Adjustable Presser Foot: The adjustable presser foot pressure feature of this model would allow you to adjust the amount of pressure that is being exerted on your fabric during the process of sewing. It is to be noted that the pressure would have been optimally pre-set. However, you can over-ride these settings according to your preferences. You can be able to change any of the four snap-on presser feet without using the screwdriver. Removable Arm: The free arm feature will provide you with an easier access to all the difficult to reach areas in your clothing. Tension System: The automatic tension system would ensure the stable stitch quality and the tension can be adjusted by using tension adjustment dial. Workspace Illumination: The workspace has been illuminated by an LED light and with the help of this; you can see your sewing space and projects easily. Included Accessories: The accessories that are included in this sewing machine set are: All purpose foot, Zipper foot, Buttonhole foot, Button sewing foot, Edge/Quilting guide, Needle pack, Bobbins, Thread spool caps, L-Screwdriver, Seam ripper/Lint brush, Foot control, Power cord. The current sewing machine model comes with various automatic setting features that will eliminate your guesswork and these features are making this model as the best sewing machine in the open market. Threading in Seconds: Threading your machine is very easy that you can have the machine threaded from the spool in just 6 seconds. You can also find the threading instructions printed on your sewing machine. Drop-in Bobbin System: The top drop-in bobbin system loads the bobbin from the top and it is easy to insert the bobbin. Moreover, the clear cover will make it convenient to monitor your bobbin thread supply. Winding System: You will have to just follow the numbered diagram that is printed on the machine and your bobbin will be full quickly. The automatic disengaging of needle bar will make your winding safer. With loads of automatic settings, the whole process of sewing operation is made easy with the Singer 4432 Heavy Duty sewing machine. The printed diagrams over the machine will make it much simpler and you will have to just follow them to complete your sewing successfully. In addition, the instruction manual along with the stitch guide will help you out in efficient sewing. The simple stitch selection will allow you to change the stitch in one step. Three needle positions (inserting zippers, cording and topstitching) provide more control. The length and width can be customized. The zigzag taper will leave you with attraction appliqués. Stitches can be set to the maximum of 6 mm. This machine has twin needle capability. This has a seven segment feed system. The drop feed function will be useful for quilting and attaching buttons. The dull color of the machine can be considered as a disadvantage. The current market’s extra-high speed Singer 4432 Heavy Duty Sewing Machine is undoubtedly the true innovation from the company which would eliminate your guesswork during the process of sewing. This outstanding can be brought with 25-year limited warranty and 53% discount offer price by just logging onto www.amazon.com.